If the seat tube of your bike's frame has a diameter of 36 mm, use two blue plastic inserts. If the seat tube of your bike's frame has a diameter of 32 mm (many mountain bikes), use only one of the largest, blue plastic insert. If the seat tube has a diameter of 28 mm (most bikes), use the white insert inside the blue insert. 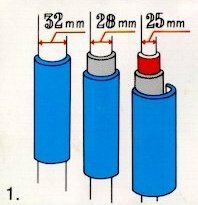 If the seat tube has a diameter of 25 mm (a few models, particularly ladies' and junior bicycles), use all three inserts (red inside, white in the middle, blue outside). 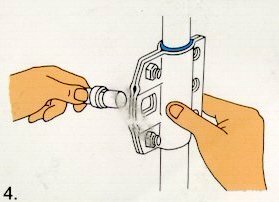 Let the opening in the insert(s) point straight forward. 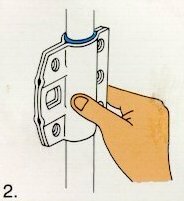 Place both sides of clamp over the insert(s) and bolt together as shown in illustration. Please see to it that the clamps are fastened high enough. There are three 'bumps' on the outer end of the S-tube. They act as a thread guide for the coil spring. Screw the spring about 1 inch down on the S-tube. Leave the eye on top in position as shown in drawing (the end of the spring wire at the eye should point straight in towards the bike. 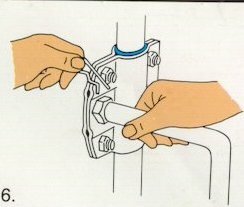 Mount the S-tube onto the bolt, and secure it by inserting the locking pin through the hole in the S-tube and the bolt. Hole 1: All children, or adults weighing less than 110 lbs. (50kg) or small dogs weighing less than 44 lbs. (20kg). Hole 2: Adults weighing over 110 lbs. (50kg) and dogs weighing more than 44 lbs. (20kg). Hole 3: Strong, skilled adult cyclists and with large, strong eager-to-pull dogs. Check from time to time that none of the nuts are loose. 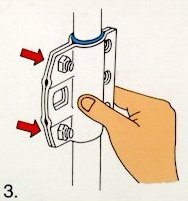 If the heel of your shoe hits the horizontal part of the S-tube, loosen the three front nuts so the clamps can be "wiggled" up until the heel of your shoe is clear of the S-tube in all pedal positions. If the heel of your shoe clears the S-tube by more than 1 inch in all pedal positions, the clamps should be wiggled down.